After receiving a warning from his virtual self in last week's Extremis, the Doctor must now prepare for the incoming monks invasion in the real world - all while still keeping his blindness a secret from companion Bill. 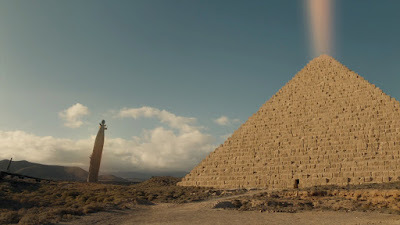 The Pyramid at the End of the World is the second part of series 10's "Monk's Trilogy", co-written by Steven Moffat and Peter Harness. 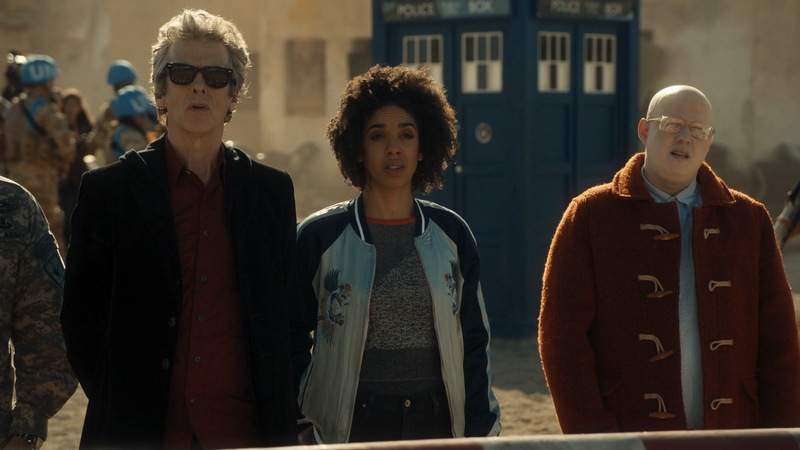 This is the fourth story Harness has penned for Doctor Who, following on from series eight's Kill the Moon and series nine's Zygon two-partner The Zygon Invasion and The Zygon Inversion (the latter of which was also co-written with Moffat). Having examined every moment from now until the end of time the alien Monks have chosen now to strike, landing a giant pyramid on land in dispute between America, Russia and China. The UN Secretary summons the Doctor for help, resuming his role as the President of the World in times of great need. However the Monks say they aren't here to conquer by force, and will only take over when humanity consents. For this consent to be pure, it must only be done out of love. 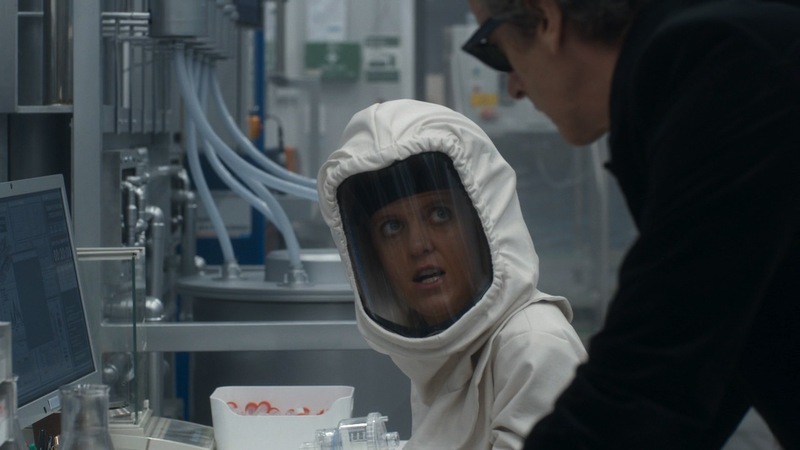 As the Doctor scrambles to find the catastrophe that will result in humanity welcoming in the monks, something completely unrelated is going on a laboratory somewhere in England. A series of inconsequential events is what may lead to humanity's end, while the Doctor's secret is about to catch up with him. After setting their invasion up with possibly the most over-elaborate and near-onipotent plan ever seen in Doctor Who, the monks had a lot to live up to when it came to pulling off the real thing. In broad sense it works and The Pyramid at the End of the World manages to build up plenty of intrigue. The Doomsday clock, the political tension and its eventual bait and switch is a great story set-up, and moments such as Bill's "real" date with Penny, the monks casually shrugging off any show of force or the Doctor cleverly narrowing down what exactly the Monks are watching are some great crowd-pleasing moments. But unfortunately when it comes down to the finer details the episode begins to fall apart fairly rapidly, hinging far too heavily on moments that happen purely out of plot convenience, which is some cases even borderline on the non-sensical. he idea that humanity's end comes from a bacteria created purely from a series of unfortunate mishaps isn't necessarily a bad one (and certainly makes for a more interesting twist than just "war/conflict"), but the scientists that inadvertently cause it are working far too dangerously for it to be believable and/or taken seriously. Not to mention that the segments involving them are just unrelentingly dull, and it isn't until paired up with the Doctor that Erica begins to develop into an enjoyable character. But what's worse than the pair's running through the lab without little regard for closing doors behind them is the fact the doors work on such an antiquated combination lock system, only there to immediately back the doctor into a corner. The fact dials don't even have raised lettering just makes the whole scenario downright laughable. Then of course it ends with the Monks also able to magically give the Doctor his eyesight back like it was no problem whatsoever, to the point where that feels like it should have been their plan all along. There isn't even any real explanation as to why exactly the monks decided to drop a pyramid of all things in the middle of Turmezistan (the fictional place that previously showed up in Harness' Zygon two-parter) - was it all really just to get people's attention? 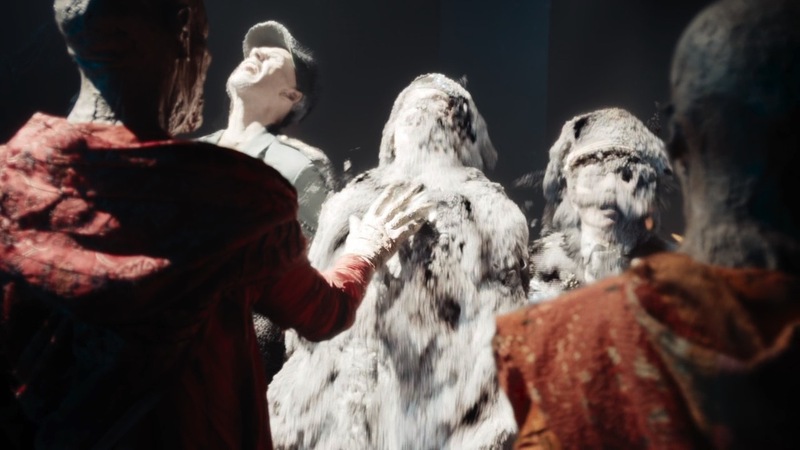 The subject of the Doctor's blindness is a rather big issue this episode has, as despite him supposedly trying to hide it from Bill it's even more obvious here than it was in Extremis. Bill only once ever questions the fact that Nardole is quite obviously explaining to the Doctor everything that he should be seeing, but immediately shrugs it off as soon as Nardole gives the weakest answer possible. This would be fine if it was an example of Bill's usual savviness and she just didn't say anything because she wanted him to tell her himself, but when the Doctor does finally spill the beans at the end of the episode she reacts with genuine surprise. If rule number one is supposed to be that the Doctor lies, then The Pyramid at the End of the World that either he doesn't lie very well or his companions are just extremely gullible. But despite these problems, the monks are still setting themselves up to be some fairly interesting villains. 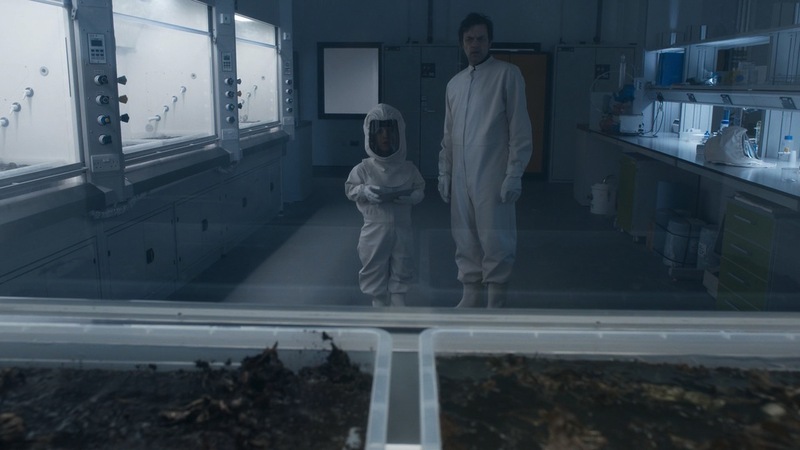 Last week I mourned the fact that their appearance is essentially throwing out my "all the aliens this series aren't inherently evil" theory I've had since the second episode, and while I still think this is likely to be true there's definitely more to them than the show has given away so far. These are creatures that so far seem to be displaying near limitless power and knowledge, yet they'll only rule the Earth if its people willingly let them. 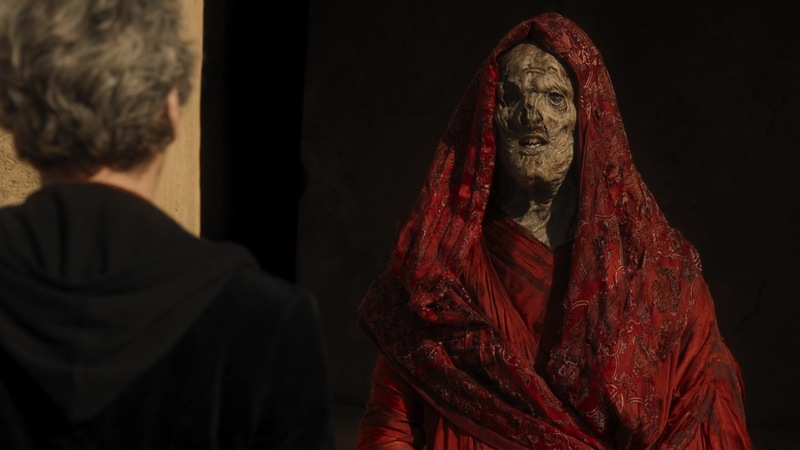 Considering a lot of modern Doctor Who episodes usually have the Doctor know his enemies inside out before they've barely made a move, there's still a whole lot to explore with the Monks despite already having appeared in two whole episodes. It's been a while since the show has come up with a new monster with obvious returning potential, but if the trilogy's final part goes off without a hitch then the Monks are a pretty good contender. 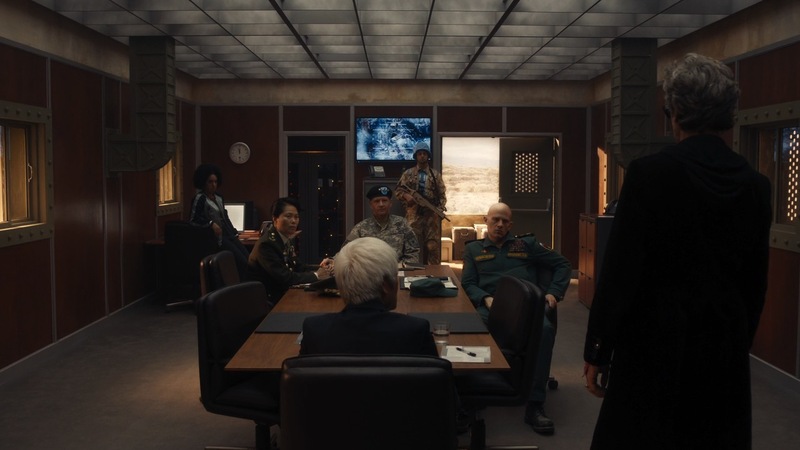 The Pyramid at the End of the World is an episode with strong ideas that builds towards an exciting cliffhanger, but on the whole leaves much to be desired. The weakest in series ten's exceptional run thus far, pacing is slow, characters are unremarkable and much of the plot advancement comes all too conveniently. 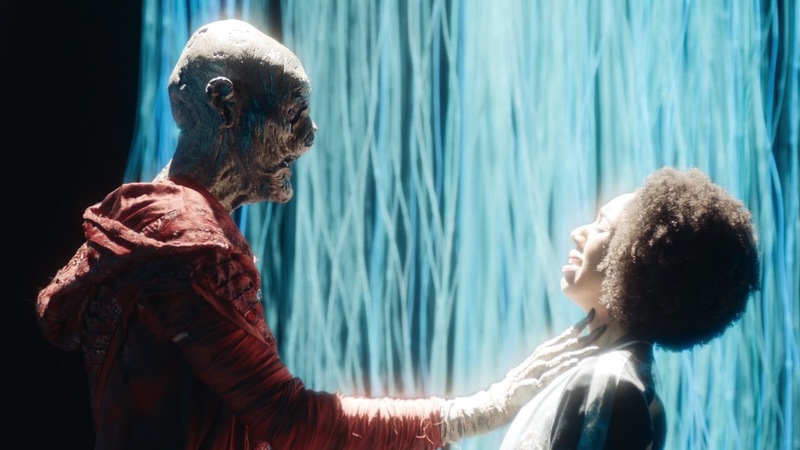 If anything the episode ultimately feels like a stop gap between Extremis and the far more promising-looking The Lie of the Land - where the Monks have taken over, the Doctor has gone AWOL and Missy is back once again.